Do We Get to Win This Time? | WHAT A FEELING! Francis Coppola has looked at the Vietnam War before. A decade ago, hot off the success of the Godfather films, he poured everything he had into Apocalypse Now, a broad, out-of-control movie that played up the insanity of Vietnam through a plot borrowed from Joseph Conrad’s Heart of Darkness. 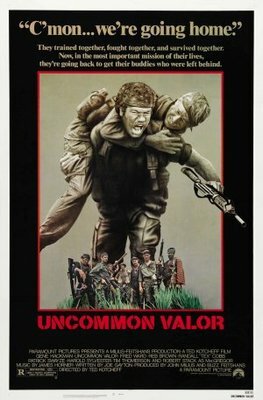 Now Coppola has made another Vietnam movie, based on a novel by Nicholas Profitt, and the contrast is fascinating. 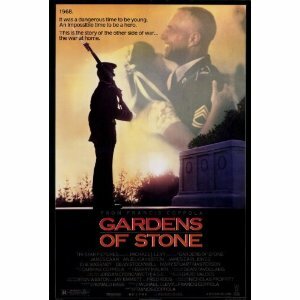 Gardens of Stone, produced with the enthusiastic cooperation of the U.S. military, shows the home front in 1968, among some soldiers and friends at Arlington National Cemetery. This time the conflict isn’t the simple war-is-madness of Apocalypse Now. This is a much more mature, and much more ambivalent movie. The central figure is Clell Hazard (James Caan, in a terrific comeback performance), a combat veteran who’s been put out to pasture as a member of the Old Guard. His main responsibility at Arlington is teaching soldiers how to bury other soldiers, but he burns to be doing something more useful. A young gung-ho soldier (D.B. Sweeney) becomes Hazard’s surrogate son at Arlington. He wants to be an officer and go where the fighting is. Hazard’s response is basically the film’s standpoint: This war is different, probably a mistake; but a soldier must serve, and should be where he can do the most good. The movie tracks the year of the boy’s tutelage under Hazard and another Old Guard sergeant (James Earl Jones, in a scene-stealing role), until the kid is shipped off. Some of the ambivalence of the time is reflected in Hazard’s relationship with a Washington Post reporter (Anjelica Huston) who thinks the war is “genocide” but who falls in love with the Army man anyway. I’m not sure Coppola feels completely comfortable with the old-fashioned straightforwardness of this story, especially toward the end, but he bravely faces it head on. 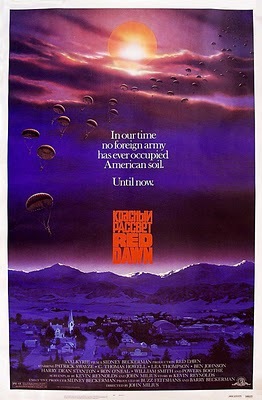 It’s a very entertaining film, with lots of inside military stuff. There’s an emphasis on the military as a family, and Hazard refers to the war as a “family business”—which reverberates intriguingly with the family business of Coppola’s Godfather. And it’s a good-looking film, both in terms of the people onscreen and the physical production. Jordan Cronenweth’s photography is excellent as usual, and production designer Dean Tavoularis, who has worked with Coppola many times, gets a late-’60s look that is discreet but evocative. Hazard’s slightly dumpy apartment, for example, is an uncannily authentic space. These details are memorable, and that’s proper. The big issues of the war won’t get settled here, and the film is at its best when it stays away from them (one of the only cheap-shot moments comes at the expense of a caricature peacenik, played by counterculture promoter Bill Graham). The movie succeeds because of its attention to the frailties of people, caught in a terrible situation. History has not remembered this movie, and to be honest, neither really have I. But it did, at least, feel rooted in something. Coppola’s son had died just before filming, and the film has a gravity that distinguishes it in the director’s work. The central character of In Country is Samantha (played by Emily Lloyd), a restless teenager who’s bursting at the seams in her small Kentucky hometown. She lives with her uncle Emmett (Bruce Willis), a Vietnam vet who has withdrawn from society. Emmett’s no wild-eyed crazy; he’s just “mentally alienated,” according to his saucy niece. 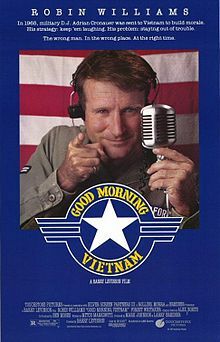 In the course of the movie, she comes to understand a bit more about his memories when she finds letters from her own father, who was killed in Vietnam before she was even born. This is the core of the story, but the film also ranges over Samantha’s strained relationship with her mother (Joan Allen), who lives in another part of the state, her ho-hum feelings about her boyfriend (Kevin Anderson), whose neck is slightly red, and her concern over her best friend, who may be pregnant. There’s nothing wrong with the film being rangy, but director Norman Jewison isn’t capable of covering that much ground. He’s barely able to make the uncle-niece relationship convincing, and it should be the heart of the movie, as Emmett is the surrogate for Samantha’s lost father. But Jewison’s notion of how to make this compelling is to stage a family argument during a thunderstorm, with loud cracks punctuating the conversation. In his previous film, Moonstruck, Jewison had a delightful screenplay and he served it adequately. Here, the script (based on a book by Bobbi Ann Mason) has real possibilities, and some wonderful characters; Emmett’s vet buddies, for instance, are refreshingly free from caricature, and a doctor who sometimes provides companionship for Emmett is a funny character (and well played by Judith Ivey). But Jewison doesn’t have enough time to give to these people, and they get lost. The story’s raggedness comes together in the finale at the Vietnam Veterans Memorial in Washington, D.C., that once-maligned black slab that has become such a potent emotional touchstone. The tear-jerking ending, undeniably effective, felt manipulative to me. The memorial is such a powerful symbol, but is it supposed to cure all the characters’ problems? Bruce Willis sheds his slick “Moonlighting” persona for the image-changing role of Emmett, and he plays the haunted vet with admirable restraint. Still there’s very little character for him to play, and Willis isn’t yet actor enough to suggest the unspoken subtleties of such a man. Emily Lloyd, who made a smashing debut in the English film Wish You Were Here, is an amazing raw talent whose emotions riot over hers expressive face. Like Willis, she doesn’t have enough to build a character with, and the film stays on a superficial level, with a walloping gut-punch at the end. 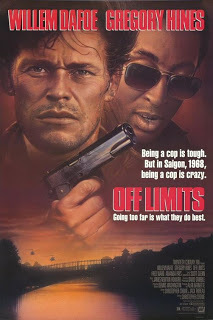 Don’t get me wrong, I liked Willis in “Moonlighting.” This was stretching too hard to be a change of pace, so he ended up looking a little forced, but it was an early indication of his future willingness to take different kinds of roles in different kinds of projects. Emily Lloyd has had her share of life problems, apparently, a real shame for anybody with a memory of Wish You Were Here. 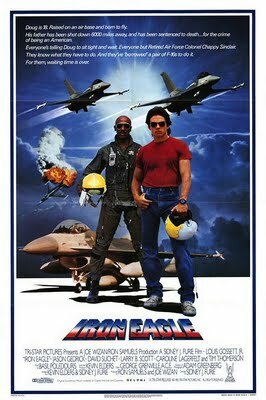 It would be tempting to rip into Iron Eagle for its crude manipulation, phony-baloney patriotism, and distasteful xenophobia. But the film itself saves you the trouble; it’s so bad on the level of plain narrative, it cancels itself out. The situation is this (as anyone who has seen the innumerable TV ads in the past few weeks already knows): An American pilot is shot down in a Middle Eastern country. The U.S. government, its hands tied by protocol and red tape, can do nothing to save him. The flier’s son steals an F-16 and flies to rescue Dad with the help of a veteran pilot. That’s it. Now, you’d think that such a streamlined plot would be easy to pull off—and as an action film, it might be good, cathartic, mindless fun. Nope. Director Sidney J. Furie (who co-authored the script with Kevin Elders) pulls a thorough botch-up. Unbelievably, although the father’s capture occurs in the first minute, it takes Furie more than a hour of screen time to get his big rescue mission off the ground. In the meantime, he presents the long, boring preparation for the mission. The son (Jason Gedrick) must prove himself time and again—first to the bullies who make fun of him for wanting to go to the Air Force Academy (there’s a big showdown at the local A&W), then to the ace pilot (Louis Gossett, Jr.) who’s going to help him with the mission. Maybe this guy should go live in the unnamed Middle Eastern country in which a bloodthirsty dictator (David Suchet) makes all the decisions, without consulting anybody. This dictator is, to borrow a phrase, flaky, and he does zany totalitarian antics, such as sentencing Gedrick’s father (Tim Thomerson) to hang in three days. So Gedrick and Gossett go charging in, and “Gimme Some Lovin'” plays on the soundtrack as they blow dozens of extras away with a Hades bomb, which incinerates everything around. It’s a mechanical movie that seeks to do for the Middle East what Rambo did for Vietnam. At least Rambo had some sense of forward motion; Iron Eagle is dead in the water until its final third. Gossett doesn’t come off all that bad, because he’s a pro, although his character is forced to perform a switcheroo; first he’s dead, then he miraculously returns. This emphasizes the indestructibility of our guys, and makes certain the happy ending will be achieved without any true, bothersome sacrifice. It also answers the question: Just how shameless can this movie be? It took me a moment to remember why I used the construction, “to borrow a term, flaky,” but it had to be a Reaganism, and it was, in Ronald Reagan’s immortal characterization of Ghadafi with that term. (Reagan’s geopolitical genius resulted in Ghadafi falling from power 25 years later – score another one for the Gipper.) One might not have predicted a long career for Gedrick based on this performance, but in fact he’s done pretty well for himself. And Sidney J. Furie? He just keeps going. You are currently browsing the archives for the Do We Get to Win This Time? category.